Madrid, October 1st., 2018.- Le Cordon Bleu Madrid, the haute cuisine school of the Francisco de Vitoria University (UFV), has received the prize for "Training in haute cuisine" in the third edition of the Gastro & Cía Awards of the newspaper La Razón. The award, which has become a classic in the field of gastronomy, was awarded in previous editions to personalities from the sector such as Mario Sandoval, Josep Roca, Roberto Ruiz and Sacha Hormaechea. 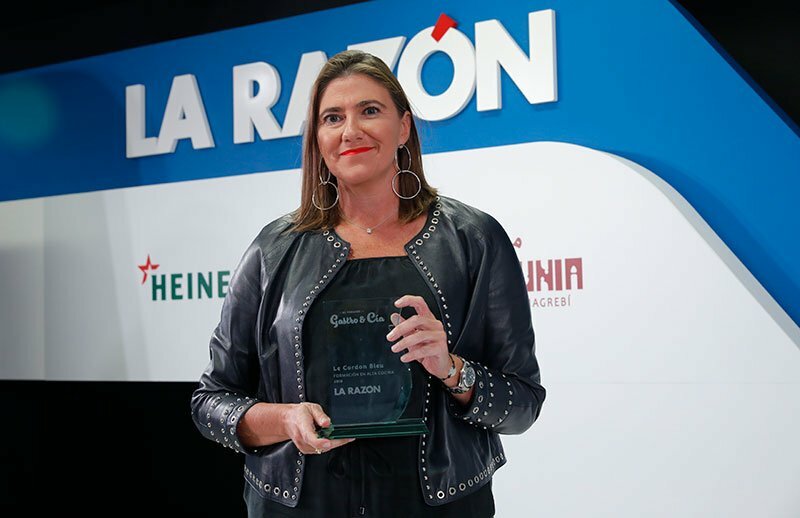 Francisco Marhuenda, deputy director of La Razón, was in charge of presenting the award to Le Cordon Bleu Madrid, represented by Rosario Barrios, general director of the haute cuisine school. This award recognizes the work of the institution in the training of future professionals of haute cuisine and hospitality. The School, in addition to promoting the learning of techniques, seeks to ensure that all its students also acquire a series of teachings that are complementary to their culinary training. During the award ceremony were also recognised Ramon Freixa, who have been awarded as the “Chef of the year”, Rafael Sandoval, with the prize “Best sommelier”, or the restaurant A’Barra, who received the “Best Restaurant” award. Opened in 2011 in partnership with the University Francisco de Vitoria (Madrid), Le Cordon Bleu Madrid is part of the the leading Global Network of Culinary Arts and Hospitality Management Institutes. Madrid is the third European School of this prestigious French institution, after the historical schools of Paris and London. It is well known for its prestigious diplomas in Cuisine and Patisserie as well as the Grand Diplôme®, the most complete programme offered by the institution. The Madrid institute also offers a unique qualification in Spanish Cuisine, which attracts numerous international students every year. The programme, endorsed by the Royal Spanish Academy of Gastronomy, covers all the most distinctive products and techniques of Spanish gastronomy.